Sunday, June 27, 2010. A letter today was published in the Guardian today signed by 171 figures from the art world condemning BP’s sponsorship of cultural institutions in the UK. The letter has been published on the day that Tate Britain is hosting a party to celebrate 20 years of BP’s sponsorship. A group of artists under the banner of ‘The Good Crude Britannia’ are planning on protesting outside the event, and will be handing out the “Licence to Spill’ briefing to people attending the party. A related posting on this site. 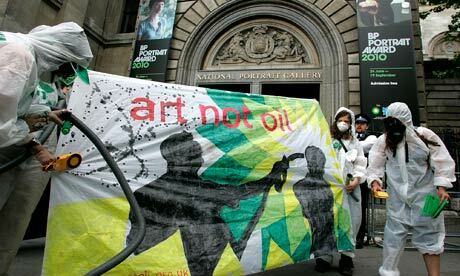 The summer season of events at Britain's most prestigious galleries and museums will be picketed by artists and green groups intent on portraying BP's arts sponsorship as a toxic brand. Protests are planned next Monday by an eco-alliance styling itself "Good Crude Britannia" at Tate Britain's celebration of its 20-year association with the international oil conglomerate. Climate change activists, artists and musicians opposed to the fossil fuel industry are determined to highlight BP's link to the arts in the context of the company's international embarrassment over the continuing oil spill in the Gulf of Mexico.